I had been wondering what to do with the chocolate tart dough in my freezer, leftover from last month’s Daring Bakers’ Challenge. Then along came Hay Hay It’s Donna Day hosted by Sarina the TriniGourmet! Sarina picked tarts for this month’s theme, so I it was the perfect time to use that stuff up. In my excitement over the latest cookbooks with glossy pages and beautiful photos, I sometimes forget about the old classics that are also on my bookshelf. James Beard’s American Cookery may be paperback, and may just have a few black and white illustrations of old-school kitchen gadgets, but it is not to be neglected. It is one of the most useful books I have. Flipping through it while my husband was watching something uninteresting on TV the other night, I came across his recipe for butterscotch pie. Butterscotch is a real favorite of mine…my first choice for a sundae topping, without a doubt. I thought that if I took his custard filling and the dough I already had, I could make some pretty nice little tartlettes. Finished off with a little whipped cream, it made a great old-fashioned dessert. Although you can use your favorite tart dough (chocolate or plain), or even a crumb crust, you can find the recipe for the dough I used at Veronica’s Test Kitchen. As is, it is quite a big batch (enough for three 9.5-inch tarts), but can easily be scaled back to make a half or a third of the quantity. Blind bake the chilled dough in the tart or tartlette pans, docked and weighted, until fully cooked. Let the crust cool completely before filling. If it will take you a couple of days to finish the tart/tartlettes, I have a tip to keep your crust from getting soggy under the custard filling. You can lightly “paint” the insides of a cooled chocolate crust with some melted chocolate and put it in the refrigerator for the chocolate to set. This acts as a barrier between the filling and crust. For a plain crust, you can get a similar result by lightly painting the insides with egg wash while still hot (just out of the oven, so the egg wash doesn’t remain raw). If you plan to finish the tart the day it is made, or if you are using a crumb crust, you can skip this step. -Melt the butter in a 2-quart saucepan. Add the brown sugar and stir until reaches 220°F (will bubble up and look slightly browner). Add 2 cups of the milk and whisk to combine. -In a bowl, whisk the eggs, flour and salt to combine. Then whisk in the remaining cup of milk. -When the sugar/milk mixture is hot but not boiling, slowly stir in the egg mixture (I tempered my eggs with some hot liquid first). Treat this like a pastry cream, whisking constantly over medium-low heat until it just bubbles. Turn down the heat (very low) and cook one or two minutes longer. Take off the heat and beat in vanilla and rum, if using. -Strain through a fine sieve into a clean bowl, press plastic wrap directly on surface and cool to room temperature. -Turn into baked, cooled crust. Smooth surface with on an offset. Press plastic wrap on surface and refrigerate until fully chilled, about three hours. -Top with lightly sweetened whipped cream (or rum whipped cream!). Steph, what a beautiful looking pie, and I bet it tastes wonderful too. You reminded me to send my link to Sarina, but yours looks like a winner! This looks amazing! You are quite the tart maestro. I would love to make these tarts. Are you using US or metric cups? Oh, wow! I don’t have butterscotch things nearly enough. This looks absolutely fabulous! Hilda– Thanks, but I just checked out yours, and I’d say those cute baby blueberry-lemon ones will take the prize! Cakebaker– I used all US measurements for the filling. If you need some conversion help, I can try to figure out wieghts. Let me know. Deborah– I know, me neither…so good, but often overlooked. Steph,I have a conversion chart so I think I’ll be okay. 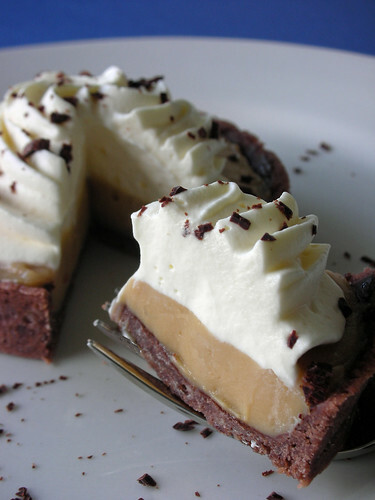 I love butterscotch and your tart looks deliious and the pix are great! Watching calories doesn’t allow me to bake as much as I’d like but I can live vicariously through posts like this! This is one beautiful tart! Steph: hands down you got my vote! These are just absolutely adorable…something about swirled whipped cream always gets to me! Oh wow Steph… this is gorgeous! I love butterscotch, and I also have 2/3 of the tart dough recipe in the freezer… thanks for the inspiration! These look terrific. You’ve reminded me that I still have a stack of this dough in my freezer. I can see some yuumy tarts coming up. That is a perfect use for leftover tart dough, looks great! 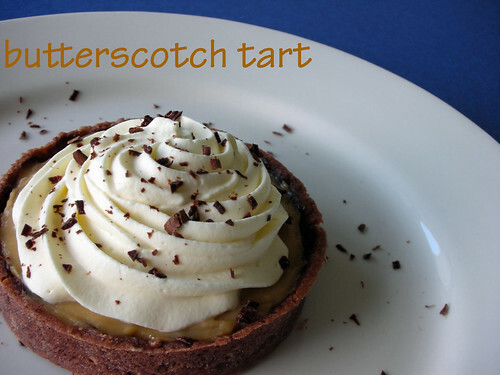 Mmm buterscotch…I want a piece of that tart! Thanks so much for taking part in this month’s round of Hay Hay it’s Donna Day 🙂 The roundup should be posted later today or tomorrow 😀 Stay Tuned! How clever of you to use last months DB challenge pastry for this. It looks wonderful. oh my goodness, this tart looks divine. Your food not only looks beautiful, but it looks delicious. I cannot wait to try some of these recipes. Butterscotch is one of my favorite flavors and you never see it anywhere. Thanks for going old school. Will give this a try. I am so glad that you linked this in your pudding post! I am so bookmarking this one. Great idea!